After several months (! ), I finally made an appointment to get my hair done! With changing jobs and the many responsibilities I've had lately, I had difficulty finding time to make an appointment. Also, yesterday Kelly treated me to a manicure and a pedicure. I've never done that before and it was really nice. The guy chuckled when he saw my nails. Yeah, I guess they needed work. The pedicure was nice, especially the little minispa for your feet. The hot towel was really hot, though! Ok, I must sound like a real "goober" as Kim would say. I've never had this experience before. She may have started something. Anyway, I thought since my nails look nice, maybe I actually should get my hair cut. I'm so lazy when it comes to that stuff. American Idol on tonight, with Gloria Estefan. After the shock of last week, it will be interesting to see what will happen this week. Jennifer Hudson? And Diana and Jasmine are still there? Not that I have anything against them. They're both sweet and are talented. But they're young and need more experience. Jennifer Hudson had improved steadily each week and should still be there. Not that it matters. I'll bet she's on the way to her first cd anyway. And La Toya and Fantasia along with her in the bottom three?? How weird is that? The only logical answer, which I read in the paper, is that the "diva" vote may be split among the three of them. I don't know. John Stevens is also lucky he's still there. Oh, the little girl vote and how powerful it is. Check out the contestants here. Into The Woods went well, although we were both so stressed. It was so difficult. It's a little intimidating when ASL students are watching. Yikes. But, we braved it. The Odd Couple should be much easier, at least there's no music. We were listening to the cd for Into The Woods nonstop and for days after Thursday, I still couldn't get that music out of my head. Good thing I like the play. This coming weekend is the last weekend for the show at Smithtown so if you'd like to see it, keep that in mind. I highly recommend it. The number for tickets is 631-724-3700. I wish I could direct you to a website (or link it) but they don't have one. Yeah, you're right, they should! If you'd like to see a cute website and a beautiful little girl, check out Megan's weblog. I'm addicted. Megan's writing is very entertaining and Annabella is such a cute little one. Tell Megan I sent you! I've been getting caught up a bit with reading. I finished The Quilter's Legacy and happened to find the next novel in the series, The Master Quilter, in the store while browsing so I read that pretty quickly. I finished half of the book last Friday during free periods at work and at home in the evening. Then I read a book I'd had sitting around for awhile, A Child Called It by David Pelzer. Oh, my Lord. What a story. Apparently, his was the third worst child abuse case in California history. In the number one and two cases, the victims are dead! Fair warning. This book is not for the faint of heart. I just started Anne Rice's Blood Canticle. This one's from Lestat's point of view again. And all is right with the world! I'm enjoying that. Douglas was right. Sondheim....a lot of words! Yikes. I feel like I'm almost there. One more afternoon and evening working on this and I should be ok. It's just so hard, my head is spinning. I don't know how actors memorize all this. I don't think I could ever do it. I just have to hear it and recognize it and I'm losing it here. I feel like it's similar to a house of cards. If I make one little boo-boo, it will all collapse! Heavenly days. Kelly played Rapunzel today for the school show. Wish I could have been there. She said she "murdered" it but hey, she did this very difficult show with no rehearsal at all. They ran the choreography THIS MORNING! Either way, she's the hero since they didn't have to cancel it. Barry Manilow was on American Idol tonight. I just loved it. This year, the performances are so strong. I thought everyone was really good tonight. I'm thinking La Toya will win it, though. She's probably the most talented of them all. This must have been a record. Simon had something good to say about the majority of the singers tonight. Wow. Ah, now here's what I should feel inspired to do. The weather is FINALLY improving, although it seems it will be in the 80's next week. Spring would be a nice change. I'm not quite ready for summer yet. I hope we can have a bit of a happy medium before it's hot. Heck, I didn't even switch over to the warm weather clothes yet. No, I'm not at all inspired to do any planting. I don't garden well. I'm more inspired to pick up the phone and call a landscaper to do a yard cleanup. Billy's injury did turn out to be an ankle sprain. We were relieved because the family doctor thought it might be torn ligaments because of the bruising. He's using an "air cast", something we'd never heard of, and seems to be walking better this weekend. I'm working on the script for Into The Woods this weekend as we're interpreting this Thursday evening. Boy, that came up on us faster than expected. After today, I hope I'll be less panicky about it. I should do some cleaning so I can actually get to the script so I should finish this now. ta-ta! The weather didn't cooperate and we had to do the egg hunt indoors but it was a nice Easter. Chicken piccatta and roasted potatoes - yum! It was an easier meal that what I usually do and I don't feel as tired as I usually do. Billy injured his ankle playing hockey Friday night. It still hurts him and he's trying to stay off of it until tomorrow when we'll take him to the doctor and probably, for x-rays. An emt at the rink said he suspects it's a high ankle sprain but it is discolored and that may mean a break. We'll see. He stayed in bed and ate there today. One more day off and it's back to work. I plan to spend some time working on the script tomorrow. Kelly and I see Assassins Tuesday evening. Bill and I had a mini-vacation in the city this week. We stayed at a hotel Wednesday and Thursday nights and saw some shows. Wednesday afternoon, we saw Thoroughly Modern Millie, looking pretty good with Susan Egan as Millie and Dixie Carter as Mrs. Meers. That evening, we visited the Minskoff to see the new production of Fiddler on the Roof. I love that play (the movie has always been a favorite) and this is a beautiful production. The set is just spectacular, in my opinion. We really enjoyed it. Before the show, we met Billy (who had been working in the city that day) at John's Pizza for dinner. On Thursday, Laura and her friend came to meet us. Bill hung out in the hotel room and Laura, her friend and I explored Greenwich Village. I even did the touristy thing and took pictures. We had dinner at Barrymore's and then saw Gypsy. Wow. Bernadette Peters is wonderful in this show. The ending is so powerful. Ok, now I have today to get things ready for tomorrow. Pooh (as the Easter bunny) can't bring those baskets if I don't get them made! I have to clean, do laundry, do the food shopping and get ready for dinner tomorrow. We're having chicken piccatta, a family favorite. Yum. I still haven't settled on dessert. I'll see what I can come up with during the food shopping expedition. 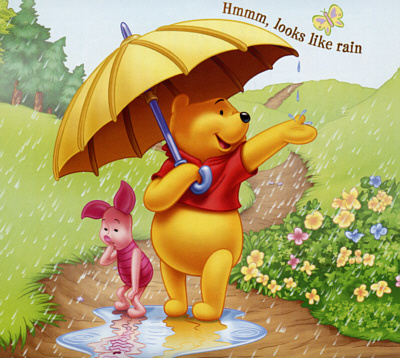 ...and I have several Pooh Easter graphics and I'm trying to use as many as I can! Hence, I'm here two days in a row. Today, in 1949, South Pacific opened at the Majestic Theatre (home to the long-running Phantom of the Opera), starring Mary Martin and Ezio Pinza. Mary Martin actually washed her hair every night on stage while singing "I'm Gonna Wash That Man Right Out of My Hair", using a small amount of Prell shampoo, which was a new product at the time. I remember seeing an interview where she mentioned that. More information here. Also today, in 1862, the battle of Shiloh concluded in Tennessee. I won't bore you with the gory details but if you'd like to read about it, here's the History channel story. I'm really bad but I'll be happy when Easter arrives and I don't have to deal with Lent anymore. I must say, though, this year Lent went by very quickly. The sun is shining today! About time, I say. It's still not very warm, though. It's in the 30's now. So even though it's spring, we're still wearing the winter things. This is what I get to do tomorrow morning because I'm on vacation! Of course, I have to clean tomorrow and do the food shopping because Sue and I saw Into The Woods this afternoon but at least I get to sleep later. I don't really sleep late, late because I just can't, actually. The latest I can sleep is maybe 8:00. Once again, I must say that this Smithtown production of Into The Woods is just exceptional. I have postcards that I intend to distribute and once Sue and I get together to work on this script, we can really start practicing it. Also, I just learned today that the 12-month national tour of Big River begins in June. One of the stops is New Haven, CT so I'll definitely see that again. The best part is that the three leads (Tyrone Giordano, Michael McElroy and Daniel Jenkins) will be joining the tour. I'm so glad. There is also a new production opening next month (previews begin this month) of a new play by the author of Children of a Lesser God and it stars Phyllis Frelich, who was in the original Broadway production of Children of a Lesser God. It's called Prymate. I should really get tickets to that one soon. P.S. Despite a few breaks of sun, it STILL rained today. Ugh! It still looks quite dreary outside today. But that's ok. After I attend the last class of this "train the trainer" course, I'M ON VACATION for a week! This course is required for uncertified teachers at BOCES tech. I taught the ASL class in the fall and again now in the spring (two classes left). So, for the past three Saturdays (four counting today), I've been in this class from 9am-1pm with a short break. I come home exhausted. I did learn a lot, I'm just looking forward to getting my Saturdays back. I've been doing all my cleaning on Sundays. Not fun. For the last class today, all of us will do a presentation, 15 minutes long! I'm teaching the class to knit. Last night, I saw the last dress rehearsal of Into The Woods at Smithtown. It's an amazing production! The sets and costumes are just beautiful and the performances are wonderful. Sue and I will be interpreting on Thursday evening, April 22. It's a real challenge. I'm glad my other responsibilities are winding down and that I have this week to really sit down and work with the script. I'm off to get this over with! You can say that again, Pooh! It's been looking like rain for the past two days and probably will continue for a few more. This morning, as I was sitting in the school library, it was simply pouring. I guess spring decided to live up to its reputation. Oh, well. April showers bring May flowers. Of course, you have to actually plant the flowers before they will grow. I'm just not that good at that part! I finished reading Testament yesterday and started The Quilter's Legacy today. I've read all the other books in this series and they go really quickly. Good stories. I'm hoping that once the ASL class is ended (two more) and I have a little more time, I can catch up on those books I have waiting for me. I also started my cable-knit sweater. It looks good so far. During the summer, I'd love to get to the east village and check out Knit New York, a cafe/knit shop. I'm not sure who will go with me as I don't want to bore anyone. Well, if there's good food there, I guess it won't be too painful to hang out with me! It's getting late so I think that's enough for today. ttfn!